Here's a wacky idea...how about we declare it a "sanctuary county" for legal residents? Or even for endangered species (no illegals do not fall under that, sorry)? 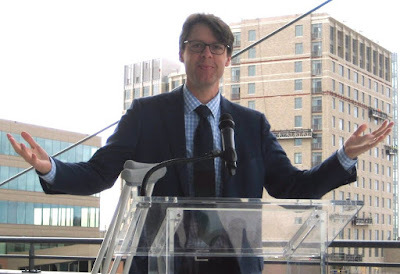 Riemer is a stain on Montgomery County, if not America in general. As someone who grew up in the Gaithersburg area in the 1970s and 1980s I can say that I've seen my hometown go from being a quiet and peaceful small town which was very safe to being transformed into a gang haven for illegal immigrants who decapitate people and deal in human trafficking and drugs.Montgomery county is like a place in a third world country.Immigration is at its highest level in a century,please people,let's be reasonable about this.We need to slow down immigration until we can get the system fixed.Its not working and we certainly don't need Montgomery County to be an official Sanctuary County,my goodness. He voted to close an effective organization for the mentally ill in Montgomery County despite promising otherwise. Can't be trusted. I'm guessing Reimer probably lives in a nice cushy, gated community in Chevy Chase completely cut off from reality? If so, why worry about the rest of the county going to hell? To Anonymous 10:29 AM...I feel bad for you having to witness your home community go downhill like this. I'm sure it was a nice quiet peaceful area back then. What's worse is this is just a microcosm of a bigger trend happening throughout this country. People who advocate for this sanctuary status nonsense are delusional and spoiled by their romanticized and twisted view of what compassion is. They cannot balance this with the realities of life and country. To Anonymous 8:34...Thank you,I completely agree with you. Actually, Riemer lives in a very nice million-dollar house in Takoma Park. Custom built of course. Not quite $1M. Currently valued at $853,700. Hans purchased it for $780K in 2012. That's a lot of house on a Montgomery County Councilman's salary. I wonder how he can afford it? Let Hans know what you think. Just accidentally deleted a comment on this post because of the stupid Blogger dashboard. It was probably a good comment, so feel free to repost if it was your comment that accidentally got zapped. I apologize for the error.